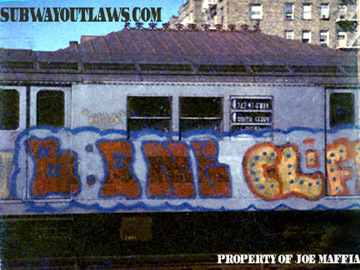 I started writing in the early 1970's, on 103rd Street on the one ( train ) line, where I just tagged all around the block. What really made me start writing is really funny; There was this guy, around my neighborhood that we all hated, so we would tag up, on his front door and just vandalize his whole building. 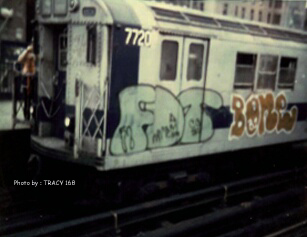 My first tag was BRA50, but I didn’t like the sound of it, so I kept the B and added a one at the end of it. I went with that idea, and that is how I got B-One. The first group of writers I met in those years, were LAZ aka LTD aka OH, MOSES147 and TAKI149. A few other writers that I went with, outside that group, were CLIFF159, COMET and PATCH147. It was mainly MOSES147 that I would hit with. 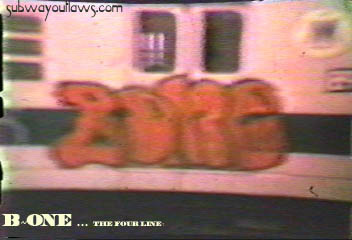 I started mainly tagging on the one line, until me and MOSES took a trip uptown, where we looked for some style. and SA ( Soul Artist ). There may have been a few other groups that I was a member in, but I don't remember their names ( off the top of my head ). I never had a war with anyone, but I still remember a fight between CLIFF and LAZ. It was when Laz and I were bombing the one yard, and were doing a top-to-bottom that, when we were finished, we realized that we went over half of CLIFF's piece. The next day, CLIFF showed up with a writer, by the name of FATCAT, and a few other of his boys. CLIFF grabbed LAZ, slapped him around a bit, and then moved on to another dude. The other dude was a little crazy, so he ended up popping CLIFF in the head, and then chased him down the block. I did have a falling out with MOSES, which started over a girl ( GWEN99 ) that we were both seeing, at the same time. We were writing words and just dissing each other on the 1 line. Later we settled it, and I ended up marrying the girl ( GWEN99 ). From 1973-1974, and the beginning of 1975, I started numbering all my pieces. It was also, then that I did my last piece with CLIFF, and called it quits. I went on to college, but CLIFF kept going on; Now that guy was crazy! It was not until I started working with Don King, the boxing promoter, in the early 80’s did I ever meet a more devious person than he. CLIFF was a born criminal. He took me everywhere, to steal whatever we could find. If we were not going to mom and pop stores in Astoria, Queens to steal paint, then we would be doing warehouses. The guy was a complete maniac! I remember this one really crazy chase that I had at the one yard. 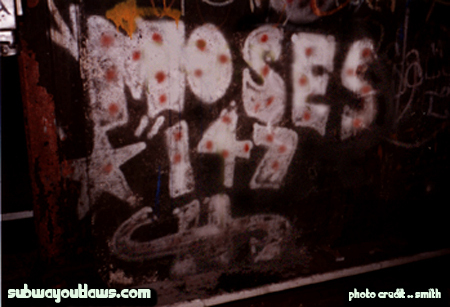 MOSES147, TAKI149, LAZ and I were doing pieces, when the door opened and the cops started racing out towards us. We ran between the subway cars to the other side of the yard where there was a foot ball game in progress; Near the field there was a metal shack from the elevated tracks, that we all decided to jump into. When we did jump, “KABOOM” the game stopped, everything went silent, and we all ran off the field like champions. As mentioned earlier, I went to college and got my degree. Currently, I am a CPA (Certified Public Accountant), have my own firm with 15 employees, and a great family. 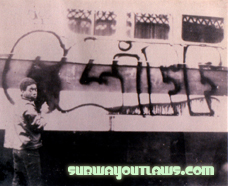 Peace to all the former Subway Outlaws!